CONSTABLE, ORLEANS, BOURBON, the DAUPHIN, and RAMBURES enter. Ô seigneur! Le jour est perdu, tout est perdu! By God! We've lost, we've lost everything! Mort de ma vie, all is confounded, all! Reproach and everlasting shame Sits mocking in our plumes. By death, everything is destroyed, everything! Blame and eternal shame sit in the feathers on our helmets, mocking us. A short sound of trumpets. Ô méchante Fortune! Do not run away. Oh cruel Fortune! Do not run away. But our ranks have all been broken. O perdurable shame! Let’s stab ourselves.Be these the wretches that we played at dice for? Oh eternal shame! Let's stab ourselves. Are these the miserable men we gambled for? Is this the king we asked to pay us ransom? Shame, and eternal shame, nothing but shame! Let us die. In once more! Back again! And he that will not follow Bourbon now, Let him go hence, and with his cap in hand Like a base pander hold the chamber door, Whilst by a slave, no gentler than my dog, His fairest daughter is contaminate. Shame, and eternal shame, nothing but shame! Let's die. Into battle once more! Go back! Let whoever refuses to follow Bourbon now go from here, and go with his hat in his hand like a low pimp holding the door to the room while his most beautiful daughter is contaminated by a slave, no nobler than my dog. Disorder, that hath spoiled us, friend us now.Let us on heaps go offer up our lives. Disorder, you destroyed us before—now be friends with us. Let's go die on heaps of bodies. We are enough yet living in the field To smother up the English in our throngs, If any order might be thought upon. There are enough of us still alive in the battlefield to smother the English with our army, if we could only think of a way to put some order into our troops. The devil take order now! I’ll to the throng.Let life be short, else shame will be too long. Damn order now! I'll go where the fight is. Let life be short, or shame will be too long. Doyle, Clio. "Henry V Translation." LitCharts. LitCharts LLC, 11 May 2014. Web. 23 Apr 2019. Doyle, Clio. "Henry V Translation." LitCharts LLC, May 11, 2014. 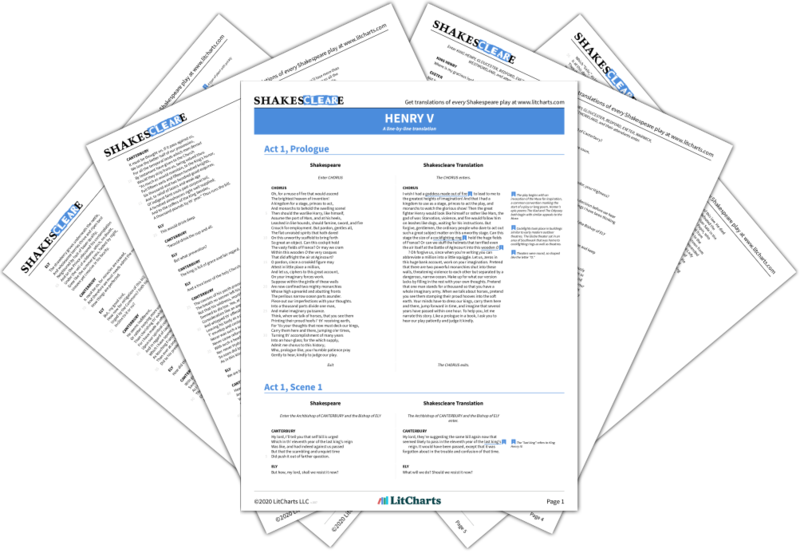 Retrieved April 23, 2019. https://www.litcharts.com/shakescleare/shakespeare-translations/henry-v.